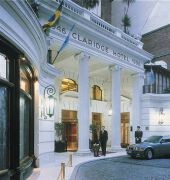 Located at Tucuman, 535, Claridge Hotel is a 5-star hotel in Buenos Aires. It provides impeccable attendance, quality accommodation conditions and a large choice of additional services, which will satisfy even the highest guests requirements. Every guest will be tempted by the restaurant at Claridge Hotel, which offers stylish decor, rich selection of delicious specialties and high-quality service. Additional hospitality facilities of the hotel include room service and licensed bar. The 5-star hotel in Buenos Aires boasts conference and business facilities, convenient for different in size and type events. To ensure the memorable stay of every business guest, the hotel also provides business services and fax/photocopying facilities. The guests of the hotel may relax and rejuvenate completely at the modern spa center of the hotel. The health and spa facilities provided on site include sauna and massage studio. The fitness room and outdoor swimming pool offered at Claridge Hotel will be appreciated by everyone looking for sport activities. For the full comfort of its visitors the 5-star hotel in Buenos Aires offers parking, nonstop front desk, rooms for non-smokers, ironing services, lift, safe at the reception, rooms with sound insulation, tour agent, Wi-Fi internet connection, free of charge Wi-Fi internet connection and air-conditioned public areas. Furthermore, transport to and from the airport, washing services, clothes dry cleaning, internet connection, valet parking, currency exchange and heating are also provided at the hotel.